Going Beyond Virtual...We're Brick & Mortar! 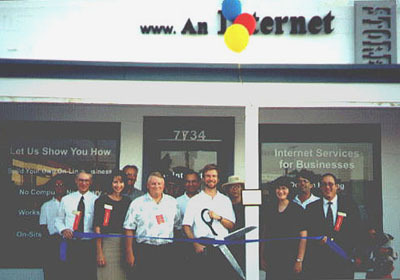 We've been servicing the Sacramento Area since the Last Millennium - 1999. We have assembled a team of talented professionals who are dedicated to seeing that our clients achieve the success they desire from their web presence. Most important is that we make ourselves available to the general public at a convenient walk-in Sacramento area, Internet Support Center in Carmichael. Our websites are built right here in the USA! While other web design companies are out-sourcing their work to other countries, An Internet Store builds websites here in America. We asked ourselves, where can the average person or business go to get help with a website or learn how to use the internet more efficiently and effectively in their businesses, or in their lives for that matter? No place existed (that we knew of) that provided walk-in support. You could go online or search a phone directory and pick some name to contact, but we decided to create a place where you can talk to more than just a technical support number that rings "who-knows where" making it impossible to meet face to face. We're real, honest people you can trust at a real brick and mortar Store, and we welcome you to come by and see us! We're not just a Technical Support phone number. Are you looking for a Webmaster that can provide you with straight talk? How about an Internet Company that gets to know you and your business, becomes part of "your team" so that we are all on the same path to your success? Then look no further: An Internet Store is here for you. Simply call 916.944.2299, email, or drop by our store, 8:30 - 5:30 M-F.